Titanium Ion Technology White & Red Baseball Necklaces - Softball & Baseball Jewelry, etc. Titanium Ionic Sport Accessories are reported to enhance performance through the production of negative ions which counter-balance positive ions created during physical stress. � Enhance Focus & Increase Stability. � Provide Relief From Muscle Stiffness. 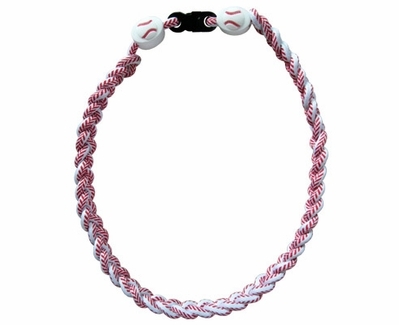 These Baseball Ionic Necklaces feature White and Red cords with lace stitching braided together into an approximately 18" long necklace, with rubber Baseball knobs on each end. Perfect for Guys or Girls looking to gain a competitive edge! Ionic Baseball Necklace will retain it's ION producing properties even when washed or wet. * Individual results may vary. These statements have not been evaluated by the FDA, and should not be used in lieu of the advice of a licensed medical practitioner or approved medical treatments.